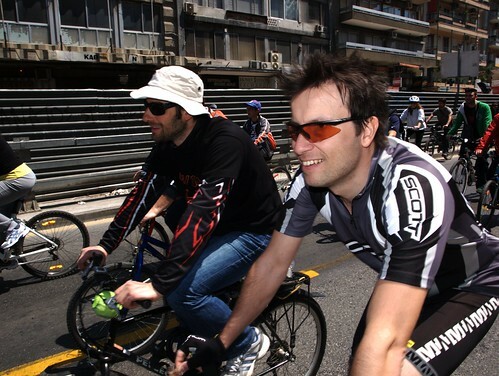 Greek cyclists take to the streets for fourth time, originally uploaded by Teacher Dude's BBQ. Taking advantage of the unusually warm weather cyclists across Greece took part in the country's fourth annual cycle ride. The event which took place in 30 venues is designed to promote the adption of bicycles in the country's cities and raise awareness of environmentally friendly alternatives to the use cars and buses for urban tranport. 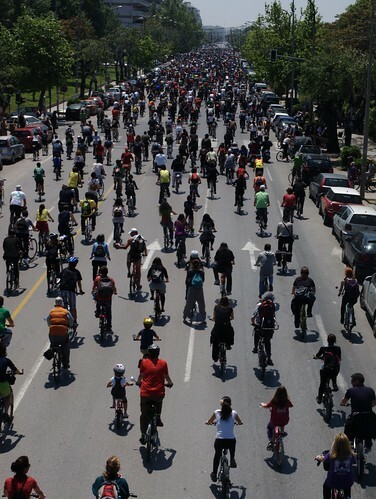 In the northern port city of Thessaloniki nearly 2000 riders took to the streets with participation by cyclists of all ages. The good weather combined with the relaxed Sunday atmosphere gave the ride a carnival atmosphere. Despite Greeks love affair with the internal combustion engine the current economic crisis in conjunction with sky high petrol prices (currently approaching 2 euros a litre / $10 dollars a gallon) means that many are digging out bicycles from storage in an effort to cut transport costs.